Why Do I Get Shocked When I Touch My Trailer Frame? How do I Replace Wood Floors in Utility Trailers? For individuals who live in trailer homes, it is difficult to give the space character and warmth. Trailer homes are typically small and feature dated design elements, such as wood paneling. A fresh coat of paint on the walls is an easy, inexpensive way to improve the look of a trailer home. Despite these challenges, it is possible to remodel your trailer home so it feels more comfortable and spacious if you are creative and use small details to make a big impact. For those on a budget, something as simple as changing the wall colors or coverings can make a significant different in the look of a trailer home. Many trailers have wood paneling on the walls, which often looks dated. Try painting over the paneling with a light shade to give it more of a country feel. If the paneling is too dark for painting, wallpaper is a good option. Paneling is also easily removed and replaced with drywall for painting. Choose bright colors for paint or wallpaper to give the trailer a larger feel. High gloss paint reflects light easily, so it also helps to make the space seem bigger. Just as with the walls, changing a trailer home’s flooring can make a big difference in the look and feel of the space. Replace bland neutral-toned carpeting with a bright, bold color. For areas of the home with hardwood floor that is stained or worn, add a throw rug to cover imperfections and brighten up the space. Fixtures such as door knobs, sink faucets and cabinet handles may seem like minor details, but in a small space like a trailer, they can make a real difference. Replace old fixtures with new models in interesting materials such as stainless steel or brass. Use fixtures that are designed for mobile homes because they are very different from those used in conventional homes. 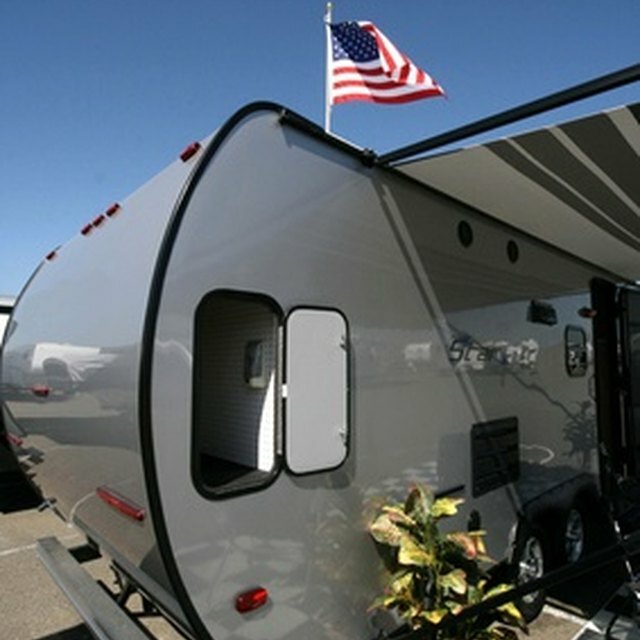 To give your trailer home’s exterior a facelift, consider replacing the roof or adding new siding. Remove skirting along the bottom of the trailer that hides the foundation, and replace it with bricks to give the home a more conventional look as well. Because space is an issue in a trailer home, adding a porch or deck is the perfect remodeling project for increasing the home’s size. A screened-in porch is a nice addition because it allows homeowners to enjoy the outdoors even in inclement weather. A deck is a more budget-friendly addition and provides space for outdoor entertaining. For an elegant look, consider adding French doors to the trailer as an entrance way to the deck.